Take SSC CPO Exam Quiz Now! SSC CPO SI exam details were officially released last year in 2018. 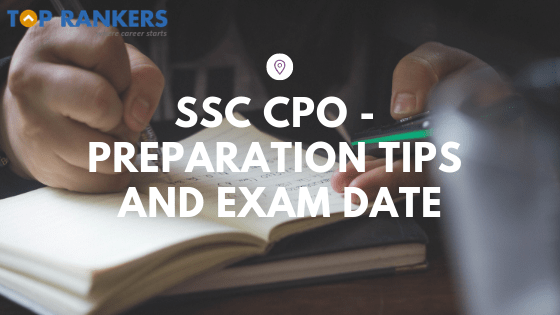 Know the Exam Dates and SSC CPO Preparation Tips and other information about the exam. SSC CPO Exams are directed to recruit aspirants for various posts including Sub Inspector in CAPFs, Sub Inspector in Delhi Police, Inspector and Sub Inspector Posts, Assistant Sub Inspector in CISF. SSC CPO Exam Date was released by the official SSC CPO website on 3rd March 2018. The last date of submission of SSC CPO application was 13th April 2018. SSC CPO Paper-1 is going to be taking place between 12th March 2019 – 16th March 2019. If you are an aspirant of SSC CPO examination 2018-19 and looking for some easy guidelines and tips to crack the exam in the first attempt itself, then you are at the right place. We have personally designed some smart and simple ways that can help you achieve your dream of cracking this exam. The first step is to understand the SSC CPO Exam Pattern. You should be aware of what kind of questions are going to be in the exam and how much marking value they hold. Also, consider the negative marking scheme which will give you a better vision of the analyzation of the exam you are going to write. Because you have only 2 hours to complete a total of 200 questions of SSC CPO Examination, there is a possibility that your speed might not match up to the certain requirement in the beginning. And to enhance your speed in order to complete all the questions in the given time, you should appear in the exam well-practiced. Practice as many mock tests as you possibly can to enhance your speed as well as to check where you precisely stand in comparison to the level of the exam. Negative Marking for each wrong attempt is 0.25 and that is why you cannot afford to attempt wrong answers. So, rather than filling up a wrong answer, try to focus on the areas where you are confident in and strive to avoid the Negative Marking. Get your hands on the questions papers of last few years and make a list of the repeated questions and do not leave those topics at any sake. Take more and more tests and quizzes to know how many more improvements you need. A study schedule will come in handy after taking a particular number of Mock Tests. Because then you would be clear as per how far have you reached and how far is still to go. Hence, follow the study Schedule religiously. Focus on what you have been dreaming for so long and you are finally getting a chance to crack this exam. With each day passes by, fill yourself with the thoughts and feelings of victory. Consequently, do not lose your concentration. Kamal Chaudhary proves to be an inspiration here who scored 1st Rank SSC CPO 2017, a student of MR. Bhagvati Sir, one of the best Math faculties who trained proficient amount of students all over India and has 15 years of mentoring experience for competitive exams in Maths. English Faculty Mr.Vijay Sir who has 6 years of Coaching Experience. He is one of the most exceptional talents of making learning easy. Click here to join SSC CPO Live Online Classes now! We have all heard ‘Hard work is the key’. But smart work is the real magic. Even if you are studying for 1 hour, make that 1 hour comes out to be highly productive. Rather than not coming to any conclusion even after studying for 8 hours. Therefore, work smart and maintain it as your priority because it is not about time. It is about productivity. For any more queries regarding SSC CPO Exam 2018-19, write down your comment below!